Stevia is an herbal sweetener to which medicinal properties, such as balancing blood sugar levels and aiding weight loss, have also been attributed. Discover all about stevia, from its origins and most popular forms of consumption, to the ideal conditions for its cultivation. Stevia is native to Brazil and Paraguay, where it has been used for hundreds of years to sweeten traditional teas, like mate, as well as medicines. Scientists today continue to conduct studies into the properties and safety of stevia, and many countries have begun approving its use as a natural sweetener. Managing diabetes. Stevia leaves have a sweet taste, but the plant does not contain any sugar, so its compounds are naturally eliminated without reaching the blood stream, which helps keep glucose levels under control in people with diabetes. Aiding weight loss. Since the compounds in stevia are not metabolized by the body, but rather eliminated without being absorbed, this natural sweetener brings a sense of satiety but lacking the added calories that are typical in sugary foods, thus contributing to weigh management. Additionally, stevia has proven effective in promoting oral health by blocking the accumulation of plaque and bacteria in the mouth, which prevents tooth decay, as well as periodontitis and gingivitis. 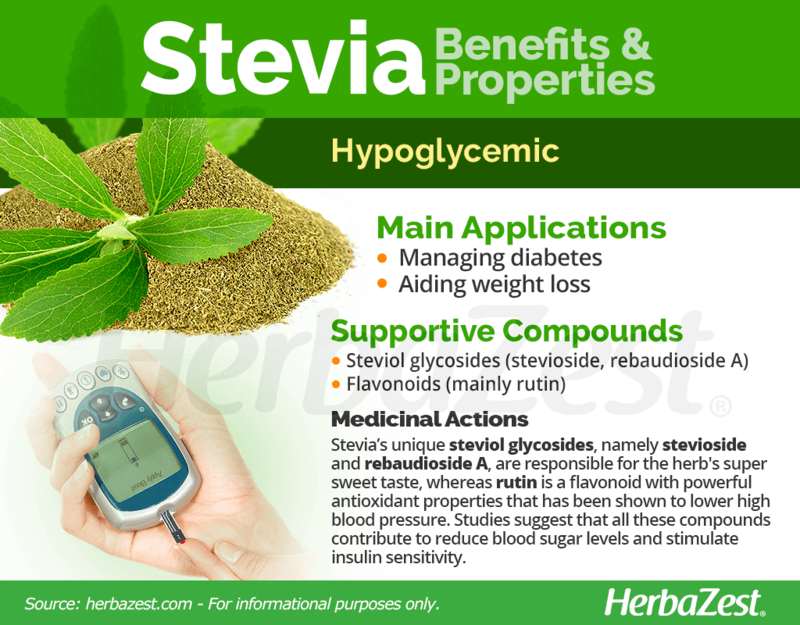 Interest in stevia stems from its unique steviol glycosides, namely stevioside and rebaudioside A, both of which are responsible for the herb's super sweet taste, about 250 - 450 times sweeter than sucrose, or table sugar, but have zero-calories. 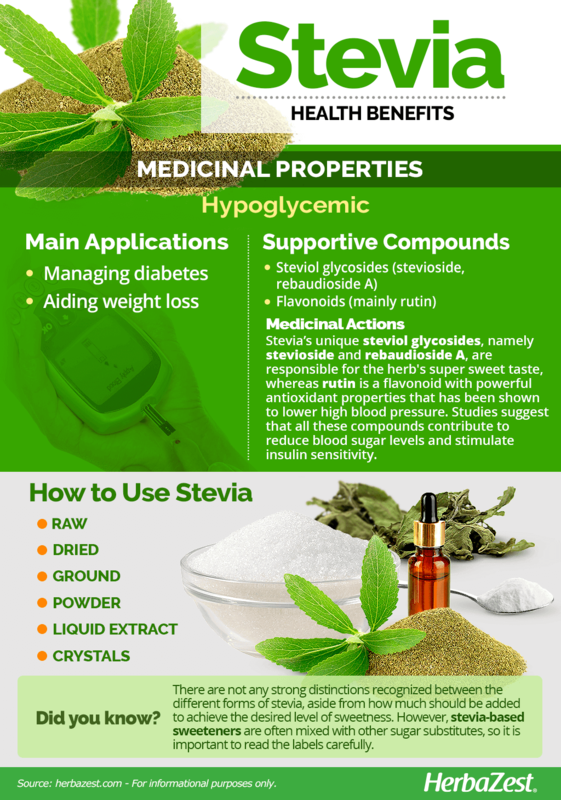 Despite the ongoing controversy regarding the medicinal uses of stevia, studies have shown that its compounds not only contribute to reduce blood sugar levels, but also stimulate insulin sensitivity, thus helping to improve the symptoms of hyperglycemia and diabetes. Additionally, fresh, raw stevia leaves also contain vitamins A and C (ascorbic acid), minerals such as zinc, magnesium, and iron, and a flavonoid called rutin, a powerful antioxidant that has been shown to lower high blood pressure by increasing the activity of glutathione peroxidase (an antioxidant enzyme) and nitric oxide in the endothelial cells, which leads to a reduced vascular tension and improves blood flow. High levels of rutin can also be found in tea plant, noni, apples, and figs. Stevioside is 250 - 300 times sweeter than sucrose but with a slightly bitter aftertaste, while rebaudioside A is 350 - 450 times sweeter than sucrose without any aftertaste. Other herbs with hypoglycemic properties that can also be used as natural sweeteners are cinnamon, lucuma, and yacon. The controversy over the possible benefits and side effects of stevia stems from the fact that many studies on this plant are in their preliminary stages. The various sweet compounds in stevia are still being researched to ascertain their long-term level of toxicity. Those with an allergy to ragweed and other Asteraceae species may also experience a reaction to stevia. Stevia can affect how the body processes lithium. Those taking lithium should avoid stevia use. As stevia can affect blood sugar and blood pressure, it should not be consumed alongside medications or supplements that affect these two factors. Stevia has not known culinary applications beyond it use as a healthier substitute for sugar, and can be found both in its natural state (fresh or dried) and in a variety of supplements. Raw. The fresh leaves of stevia can be used as a natural sweetener for hot and cold beverages. Dried. In their dried form, stevia leaves have a longer shelf life and can be used in infusions. Ground. The dried leaves of stevia are often finely ground and used directly, as a natural sugar substitute, in beverages and baked goods. This pure stevia powder is green in color. Liquid extract. This is a popular form of consuming stevia, since it lacks the slightly bitter aftertaste of natural forms. Powder. The active compound of stevia, rebaudioside A, is chemically extracted in order to obtain a sweet powder. Crystals. Stevia crystals look like sugar cubes and are used in the same way, but without any caloric content. There are not any strong distinctions recognized between the different forms of stevia, aside from how much should be added to achieve the desired level of sweetness. Both stevia seedlings and seeds are available to be purchased in some nurseries and garden centers; however, it is more likely to found them through online plant retailers. The plant is also easy to get by in dried and ground forms, in herbal stores and online retailers. 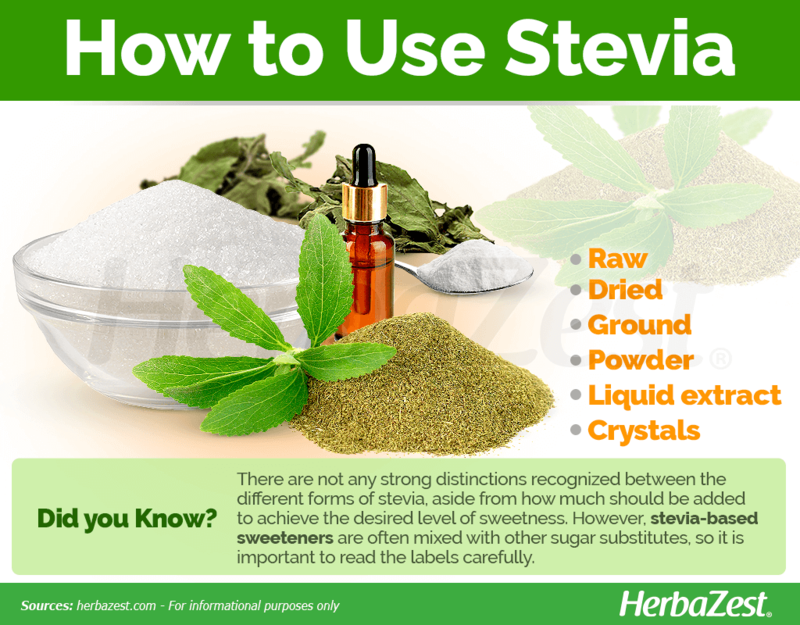 Stevia products, such as liquid extracts, processed powder, and crystals are widely available in most mainstream supermarkets, but they can also be purchased online or from specialized health stores. It is important to notice that stevia-based sweeteners are often mixed with other sugar substitutes, so it is necessary to read the labels carefully. Stevia is small shrub from the tropical forests of South America, and some basic conditions need to be considered in order to succeed in its home cultivation. Stevia should be grown in well-drained garden beds, though it will also adapt well to a large container. This plant grows better in neutral soil, with an ideal pH of 6.7 - 7.2. It grows best in warm conditions, similar to those of its natural tropical and subtropical habitat. Stevia needs to be regularly pruned to return optimum results. The stevia plants should be planted about two feet (60 cm) apart from each other after the last frost in an area that gets full sun. Three to five plants will grow a year's supply of leaves, which can be plucked and dried. More detailed information about growing stevia can be found in the herb garden section. Native to South America, particularly Brazil and Paraguay, the stevia plant grows to between 26 - 32 inches (65 - 80 cm) tall, in semi-dry mountainous environments, and is covered with fine, short, white hair. It bears white, cone-shaped flowers with long stamens. The green parts of the plant provide its valued sweet taste. Stevia is a member of the Asteraceae (Compositae) family, commonly known as the aster, daisy, or sunflower family. This family contains 23,000 species spread out over 1,620 genera, including economically important crops, such as artichoke (Cynara cardunculus) and lettuce (Lactuca Sativa), as well as medicinal herbs like milk thistle (Silybum marianum), chicory (Cichorium intybus), and chamomile (Matricaria chamomilla). The Stevia genus contains 240 species of herbs and shrubs, being Stevia rebaudiana the most economically-important. 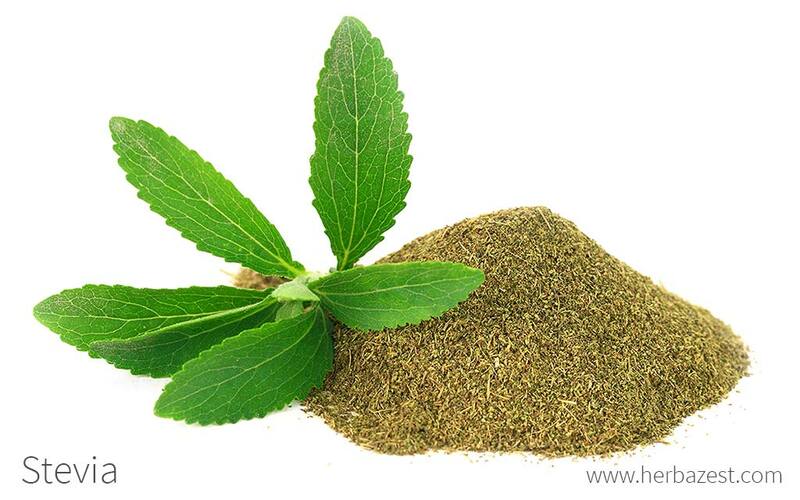 Although there are many different species of the genus Stevia, S. rebaudiana is the only one that possesses the natural sweetness for which it is valued. To date, no subspecies or other varieties have been identified in the wild. However, Japanese food and confectionery companies have developed the 'Rebaudio' cultivar for use in their products. Stevia has been an important herb in certain South American cultures for over a millennium, and its consumption by the Guaraní people, in Paraguay, can be traced as far back as 1,500 years ago. In 1899, Swiss botanist Moisés Santiago Bertoni began conducting research into stevia while in Paraguay, becoming the first Westerner to describe it in detail. However, research remained limited until the 20th century, when there was a more thorough investigation into its sweet properties. Stevia has grown into an economically-important product since it began being used as a sugar substitute. In 1971, it was first commercialized as a sweetener, and since then, many large firms have begun using it in their products, which has encouraged different countries to invest in its commercial cultivation. Currently, China is the largest exporter of stevia, and the plant is continuing to grow in popularity. Some manufacturers have begun adding stevia to toothpaste to improve its taste. Aside from this, though, stevia is used almost exclusively as a food and beverage additive or for supplements.